While attending the Utah Quilt Guild Quilt Fest last week, I heard Anita Grossman Solomon speaking during one of our luncheons. She is a very entertaining speaker, telling us interesting stories about her life in Manhattan, how she prepares fabric before using it, where she hangs the fabric to dry... Her quilts are beautiful, and her method of cutting the fabric is worth a try, as it is so simple! I realized then I do have her book, Rotary Cutting Revolution. Each of the blocks feature detailed instructions with plenty of photographs so we can easily understand and make them. I have just added to my 'to do' list (pretty soon I will need a roll of paper for this list...) a quilt with the self-mitered log cabin block on page 88. I may also need to try her pineapple block - it seems much quicker than the traditional way of making it. Throughout the book Anita provides time-saving tips and notes about how to ensure you get enough fabric at the store, best way to sew using foundation paper, how to get the most out of fabrics as you cut them, etc. The 'Ask Anita' section at the beginning of the book answers most questions we might want to ask her, and I suggest you read it before you start any of the projects - it is like having her next to you as you attempt to make one of her blocks. 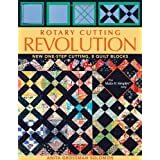 If you like to learn easier ways to cut quilt blocks (and how to make the windmill block without wasting fabric, as happens when we use the Twister ruler), you will like this book! Thanks you. I will have to get the book.